Alvechurch bellringers won the call change section of the North Worcestershire Bells Striking Competition held at Brierley Hill last month. Having won for three years in a row, they will now put a team into the methods section of the competition next year. The band (pictured, from left) was: Pippa Morley (Treble), Penny Bradsell (2nd), Greg Hunt (5th and Caller) Pam Morley (3rd), Geoff Franklin (4th), and Colin Bennett (Tenor). The five-minute piece had to include the following changes: Queens, Seesaw, Hagdyke & Whittingtons and was won on least faults which are counted as any clips, crunches or pauses. 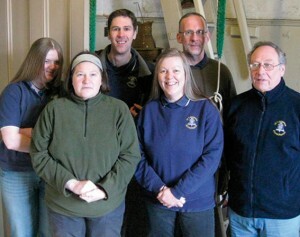 Alvechurch St Laurence ringers are still busy raising money for the refurbishment of their bells and have now passed a total of £50,000 towards their target of £60,000.